Remember, the end result is not important. What is important is the creative process. Children learn through play…so let’s have some fun!! Art and craft ideas for kids using paint and brushes. Painting art and craft ideas for kids using paint rollers. This is usually the “normal” way to paint – with traditional brushes. And while it can be lots of fun – it should not be the only way. Try a combination of various types of brushes to add different strokes and interesting affects. Have a look around the house for any other brush-like item your kids can try. Roller painting is fun way for toddlers and preschoolers to experiment with different painting tools. Paint rollers are cheap to buy. They can be purchased from discount stores or art supplies outlets. They are usually made of foam, and come in different sizes – commonly sold in packs of various sizes. Roller painting is perfect for stenciling – or painting over objects to achieve interesting prints. 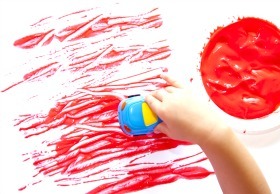 It’s great for preschool kids creating craft projects that require large backgrounds. Spray painting is so much fun for children, and they love it because it’s a different form of painting. It is such a cheap art and craft activity, and the only thing you really need is a spray bottle and some water – paint and paper is a bonus. Try various types of spray bottles – such as different recycled general household spray bottles that have had safe contents in it. Wash thoroughly and keep them for painting. 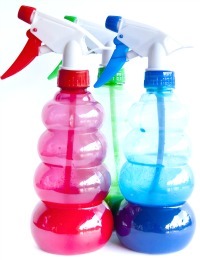 Cheap all-purpose spray bottles can be purchased from discount stores with adjustable nozzles. Adjusting the nozzle during painting results in interesting affects. Spray painting is best done outdoors – as it can get messy. Kids, including everything around them will get wet! Simply fill a spray bottle with water and let you child “paint” the sidewalk, outside of the house, trees, grass and even the family dog – it will keep them busy for ages. For spray painting with paint, the best surfaces to paint on are material and blotting paper. Paint stamping is basically using any object and paint to make interesting prints on paper or other surfaces. The looking for, and collection of items to paint with can be just as much – if not more – fun than the paint stamping itself. Acrylic paint, poster paint and tempera paint can all be used for paint stamping, or make your own paint at home for a fraction of the price. Try a combination of items to paint stamp with for a variety of different prints, shapes and interesting affects.